Georgia Executes Davis: Supporters Claim Injustice : The Two-Way It was a dramatic night, which saw the scheduled execution delayed for more than four hours, while the Supreme Court weighed Davis' request. In the end, the court released a one-sentence statement denying the request. Davis was then injected with a lethal cocktail of drugs and pronounced dead at 11:08 p.m.
Minister Lynn Hopkins, left, comforts her partner Carolyn Bond after hearing that the U.S. Supreme Court rejected a last minute plea of Georgia death row inmate Troy Davis. Jon Lewis, of WSB Radio, who was one of the media witnesses, said Troy Davis was "defiant until the end," maintaing his innocence in his final minutes. The execution started at 10:53 p.m. Davis was asked if he had any final words. Death row inmate Troy Davis in an undated photo released by the Georgia Department of Corrections. Davis lifted his head up from the gurney and said he wanted to talk to the family of the victim. "The incident that night was not my fault," he told MacPhail's family. "Look deeper into this case to find the truth." He then addressed the prison officials performing the execution. He told them, "may God have mercy on your souls. May God bless your souls." The procedure was somber, said Lewis. It was very quiet. The only sound in the room they were in was the airconditioning. When the first of a series of drugs were pumped into Davis' veins, his eyes shifted a bit. But when the final, mortal drug was injected, there was very little movement. At 11:08 p.m., Davis was pronounced dead. Lewis said MacPhail's 22-year-old son and MacPhail's brother smiled. "The MacPhail family seem to get some satisfaction," said Lewis. Despite a last-ditch appeal to the United States Supreme Court and calls for clemency from dignitaries like Jimmy Carter and Pope Benedict XVI, Troy Davis was executed in Georgia today. It was a dramatic night, which saw the scheduled execution delayed for more than four hours, while the Supreme Court weighed Davis' request. In the end, the Supreme Court released a terse one-sentence statement denying Davis' request and a bit before 11 p.m., Davis was injected with a lethal cocktail of drugs. At 11:08 p.m., he was pronounced dead. Davis was convicted in the 1989 murder of off-duty police officer Mark MacPhail. MacPhail's family told The Atlanta Journal Constitution before the execution they had "no doubt" Davis was guilty. "I'd like to have some peace now that it's over," Anneliese MacPhail told CNN right after the Supreme Court rejected Davis' request for a stay. The application for stay of execution of sentence of death presented to Justice Thomas and by him referred to the Court is denied. On CNN Jeffrey Toobin, who writes about legal affairs for the New Yorker, says this case has revived talk about the death penalty. And it puts into focus something the courts point out in relation to the death penalty. Toobin said courts say the certainty needed to sentence someone to death "is different" than that needed to send someone to prison. Benjamin Jealous, head of the NAACP, said in an interview with Democracy Now! that this case will make Americans question the death penalty. "[Americans] want to believe that the death penalty is precise," said Jealous. This case throws that belief into question. Toobin added: "It's important to emphasize that the courts have never found he is innoncent." That, after what Toobin called one of the most rigorous judicial reviews of any death penalty case. The court did not comment on its order late Wednesday, four hours after receiving the last-ditch request. State Attorney Generals office notifies MacPhail's mother Anneliese they have received an email from the U.S. Supreme Court to expect word in another 10 to 20 minutes. The Atlanta Journal Constitution reports that more than a dozen Georgia state police in riot gear have moved into the area outside of the prison. "They were met by choruses of 'Shame on you' from the protesters," reports the AJC. Larry Cox, the executive director of Amnesty International, which has led protests in support of Davis, told Democracy Now! they don't know much about what's going on. He said they've met with protesters to try to prepare them for bad news, he said, so they could react properly and within the peaceful spirit of the campaign. 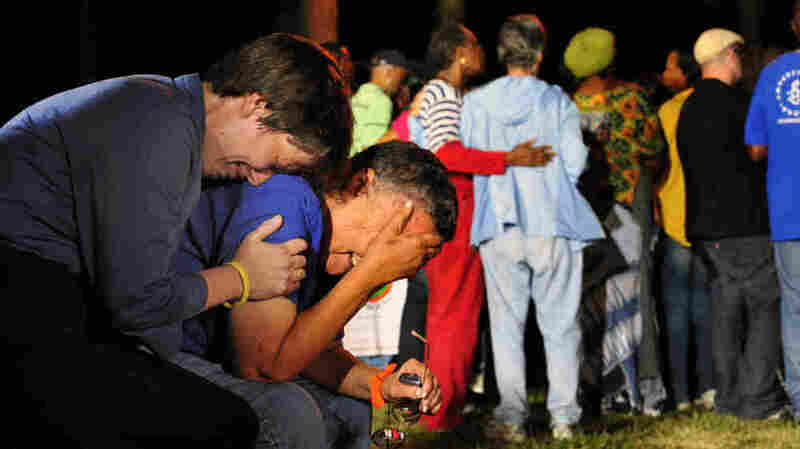 "All we can do is wait and pray," said Cox. Rev. Raphael Warnock, the paster at Ebenezer Baptist Church in Atlanta, said in an interview with Democracy Now! that this is the fourth time Davis goes through this process. In the past, his executions have been stayed hours before he was scheduled to die. "We're glad he's still here," said Warnock. "But this whole process is unusual punishment." In an interview with the AP, Anneliese MacPhail, the victim's mother, said she was "a nervous wreck" as she awaited a decision from the U.S. Supreme Court. She said that Davis had "all the chances in the world" to clear his name. Also a note: Atlanta's channel 11 has live video of the scene outside the jail. As the sun sets in Georgia, Anthony Davis has not yet been executed. Democracy Now!, which is broadcasting live from outside the state prison in Jackson, showed images of Davis supporters singing and praying as they await word. Ed Dubose, the president of the Georgia chapter of the NAACP, said in an interview that Davis' case represents "everything that is wrong with the death penalty." He said that the fact Davis has lived this long means there's "something special about this moment." "Even if this moment does come to pass, he has given us a reason to continue to fight," said Dubose. The Atlanta Journal Constitution has a reporter at the side of the victim's mother, Anneliese MacPhail. She "was leafing through photos of her son, and in her words "smoking like a steam engine" as she awaited word on whether the execution would proceed tonight," the paper reports. Sara Totonchi of the Southern Center for Human Rights confirms the prison has temporarily delayed the execution while awaiting word from the U.S. Supreme Court on whether they can proceed with the execution tonight. At 7 p.m. 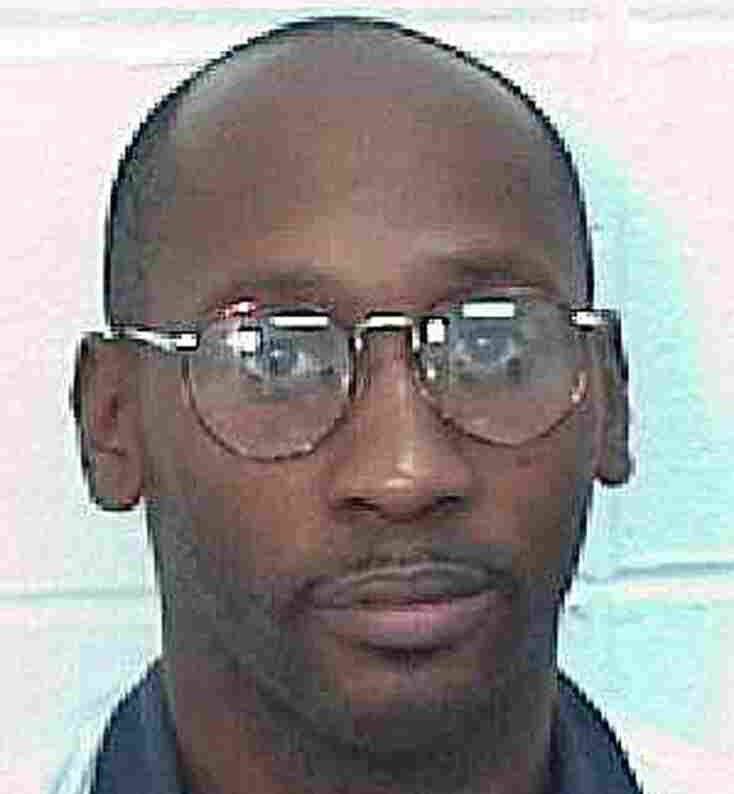 ET today, Troy Davis is scheduled to be executed in the state of Georgia. Davis' case has garnered international attention and he's been at this point three times before. As The Atlanta Journal Constitution reports, on one occasion, the state stayed his execution two-hours before it was set to take place. If you're not familiar, Davis was convicted of the 1989 murder of an off-duty police officer. But his conviction was based on eye witness accounts and no physical evidence. Through the years, some of the witnesses have walked back their testimony and doubts have emerged about the case. So much so that the Supreme Court gave Davis a chance to prove his innocence. The AP reports that was the "first time it had done so for a death row inmate in at least 50 years, but he couldn't convince a judge to grant him a new trial." High profile Americans have also taken up Davis' cause. Former President Jimmy Carter wrote a letter on Davis' behalf. And former Rep. Bob Barr, a pro-death-penalty Republican, has called for a stay. "Even for death penalty supporters such as myself, the level of doubt inherent in this case is troubling," he told the AP. The family of the victim, Mark MacPhail, is convinced Davis is the killer. "In my judgment, there are no judicial options left to Davis and there are no executive options," he said. " At 7 p.m., you can be sure he'll be strapped to the gurney, and I'd expect that by 7:15 pm, Troy Davis will be dead." That said, Wilkes believes the state should commute Davis's sentence to life without parole. "I think this is a clear case where Troy Davis's guilt is not certain," he said. "It may be probable or even very probable, but it's not certain and I believe no one should be put to death unless evidence of their guilt is certain." The Atlanta Journal Constitution reports that with satellite trucks and a mass of protesters, the scene outside the prison in Jackson, Georgia, where Davis is scheduled to be executed, is "unlike any previous executions in past years." In Savannah this morning, about 18 supporters gathered outside Chatham County District Attorney Larry Chisolm's office to present 240,000 signatures of people asking for clemency. Organizer Sister Jackie Griffith said the group hopes Chisolm can use any influence he may have to urge Chatham Superior Court Judge Penny Freesemann to halt the execution. "We believe anyone who has power should use it for justice," said Griffith, a Catholic nun who has worked to stop Davis' execution since 1998. She said she was drawn to the case because she believes all life is sacred, "whether it's a guilty life or an innocent life." "We're very prayerful and dogged in our efforts...we're always hopeful, but hope comes with reality," she added. Holding a sign that read "Justice for Troy Davis, Too Much Doubt," supporters Denise Chaney and Valdara Wall chatted about the case, referencing the man who was with Davis around the time of the shooting, Sylvester "Redd" Coles, who is rumored to have admitted in recent years to have murdered Officer Mark Allen MacPhail. "When Redd finally comes forth and admits it, how are they going to bring Troy back?" Wall asked. The last-ditch effort came after state officials refused to grant Davis a reprieve in the face of calls for clemency from former President Jimmy Carter, Pope Benedict XVI and others.